Located in Renton, WA just 20 minutes from downtown Seattle at Advanced Holistic Health Center. Easily accessible by car or public transportation with ample free parking. 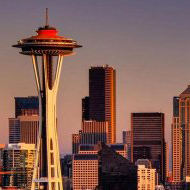 This DeepFeet training location is ideal for those that live in the NW region or for those who want an excuse to visit the beautiful city of Seattle. Seattle, WA has an abundance of coffeehouses, restaurants, and boutiques, as well as a number of small performing arts theaters. The rich and diverse population along with the culture of openness and acceptance makes it the optimal environment for learning Ashiatsu Barefoot Massage! There is a private one bedroom apartment located walking distance to the studio available for $100 a night. Please email info@deepfeet.com for more info on that rental space.